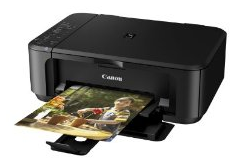 I recently bought a Canon MG3250 printer, this is a classic printer with a good quality price average for home usage (wifi, recto-verso, scan). /!\ Note : if your router doesn't support WPS functionnality, you have to setup your printer with the installation cd on windows or MacOS. open http://localhost:631/ (it's the web interface for CUPS) into a browser window and configure your printer from there. Now you can launch scangear ( scangearmp command) and launch a scan through wifi.